HOUSTON — U.S. authorities released a 10-year-old immigrant girl with cerebral palsy who had been detained by border agents after surgery because she is in the U.S. without legal permission. 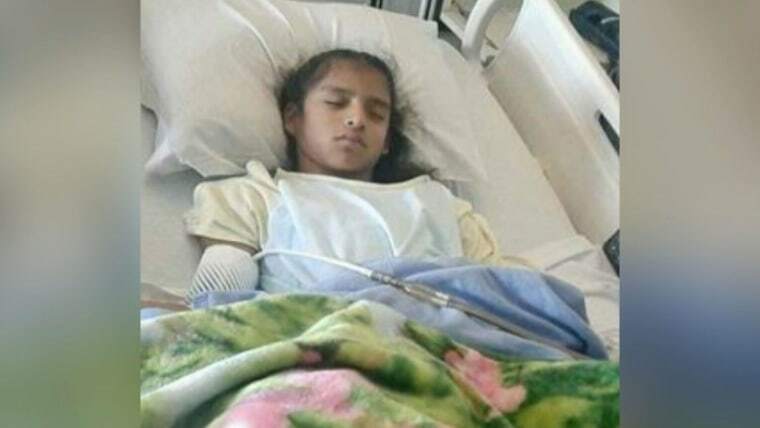 A cousin who is an American citizen took Rosa Maria from Laredo to a children's hospital in Corpus Christi on Oct. 24, where she was scheduled to have emergency gallbladder surgery. To get to Corpus Christi, about 150 miles away, she had to pass through an interior checkpoint in South Texas operated by the Border Patrol. The ACLU sued the government on Rosa Maria's behalf Tuesday, argued that the U.S. government violated federal law on unaccompanied minors and endangered Rosa Maria's health by not sending her home. "She never should have been in this situation in the first place," ACLU lawyer Michael Tan said Friday. "There is no reason Border Patrol had to target a child." U.S. Customs and Border Protection, which oversees the Border Patrol, declined to comment. HHS declined to comment on Rosa Maria's case, but said the agency's focus was "on the safety and best interest of each child." Leticia Gonzalez, an attorney for Rosa Maria's family, said the 10-year-old had the mental capacity of a child closer to 4 or 5 years old due to her cerebral palsy. Priscila Martinez, an activist at the Workers Defense Action Fund, said the child had started to show signs of socially withdrawing while in detention and refusing to eat her favorite kind of bread. Related: Trump's Wall Prototypes Are Done. Now What? Federal immigration authorities have faced strong criticism from advocates and some Texas Democratic congressmen over their handling of the case. Castro, a San Antonio Democrat, said Friday that he had tried to see Rosa Maria earlier in the day and had spoken to federal officials about her case. He said Border Patrol agents could have chosen to let Rosa Maria pass through the checkpoint without following or detaining her. "Staking out the hospital room of a young, sick girl and keeping her away from her family is not a humane treatment for her," Castro said. But U.S. Customs and Border Protection said in a previous statement after she was detained that "there is no discretion with regard to the law whether or not the agents should enforce the law." Gabriel Acosta, assistant chief patrol agent for the Border Patrol's Laredo sector, said Tuesday that his agents moved quickly to get her through the checkpoint and "acted professionally and compassionately to get this child the medical attention she needed."